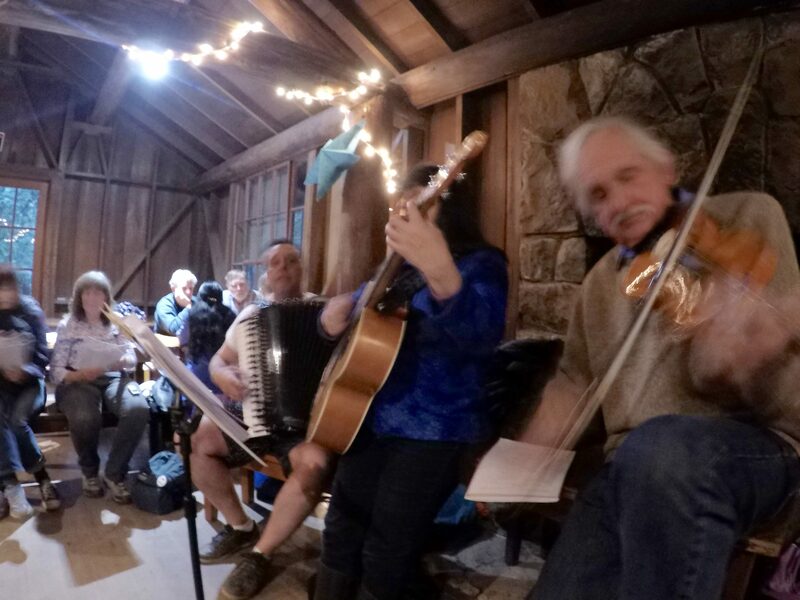 In the town of Arcata, California, population 17,000, we have extraordinary good fortune in the availability of live music for our dance community. Yes, we have jazz bands, salsa, Afro-Cuban, bluegrass and Celtic bands playing at coffee shops, dance venues and festivals. But, I’m talking about Balkan music. Currently, we have a choice of six groups, playing mostly Balkan dance music. This isn’t a new event. In the twenty-five years, I’ve lived here, I can count a dozen groups, from duos to bands of five or six, that have played live Balkan music. One of the main reasons, I believe, is the existence of a community, open-door band: a band nursery, if you will. It does require a few dedicated leaders. Folks who can be good coaches and organizers. Experienced musicians who can guide a group of mixed-level singers and instrumentalists. But the door is really open. There are no auditions or qualifications. If you want to sing or learn to play an instrument, you are welcome. Sometimes the results can be lopsided. What happens when you get three drummers, a recorder and a ukulele? Also, the mix isn’t just instruments. There are experienced singers and musicians, but not experienced in Balkan music or style. There are folks who have been dancing to Balkan music and know how it sounds but haven’t ever held a folk instrument. The last two years, Linnea Mandell and yours truly have continued this little outreach. We call it our Balkan Meetup. The formula is a time slot set for 90-minutes. The first thirty minutes is a cappella singing. This includes songs with three or four parts such as choir pieces from Croatia, Serbia and, of course, Bulgarian choir songs made famous by the Les Mystere des Voix Bulgares recordings. But, there is also room for songs with a single melody and drone, which echo a more village-y feel. We’ve been fortunate to have a good mix of voices, so that all parts are covered. A nice by-product of this process is that people who have voices straddling more prescribed ranges of soprano, alto, tenor and bass can experiment and stretch themselves. The second half-hour is combining instrumental accompaniment to singing. We have a mix of Balkan instruments like gaida, gudulka, kaval and tupan as well as flutes, fiddles, guitars and cellos. Most of these songs are dance music, but not exclusively. The last 30 minutes is just devoted to instrumental music. The folks who only wish to sing are free to go while the group works on dance music. The end result is also a mix. There will always be folks who just come to make music with no long-term plans. But, there are also folks who, after getting their taste of Balkan music, want to continue. These folks tend to seek out like-minded colleagues and start play together on a regular basis and build a repertoire. Ta-dah! The beginning of a band or vocal group. As with any learning group, it can be a longer process and requires patience. But, it really can pay off. I encourage you to make the investment.